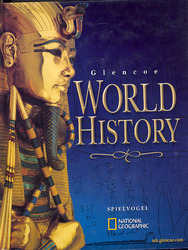 Glencoe World History, a comprehensive course that covers prehistory to the present day, helps link the events of the past with the issues that confront students today. It motivates and engages students in meaningful learning as they develop an understanding of the worlds cultures and an appreciation for the interdependence of world regions. New! Reading Essentials and Study Guide contains the entire text rewritten at a lower reading level. Combined with the World History Audio Program, the guide is a powerful reading tool for reluctant readers.